Products - EWC Lift Systems Ltd.
For further description of each accessory please scroll down. For any further information please give us a call @ 360-666-3565 and someone will be happy to answer any questions you may have. With the new and improved EZ-Bathe inflatable tub/shower system anyone can enjoy bathing the way it’s meant to be – soaking wet! The EZ-Bathe allows you to enjoy the bath or shower without leaving the bed. A caregiver can simply roll and individual on the vinyl tub,, which is then inflated around them using the included wet-dry vacuum. The reinforced tub with its new streamlined design is longer and deeper. Tub inflates to 71”L x 31” x 13 ½” H to accommodate individuals up to 6’2”. Fits all beds! The hand-held shower connects to a tap up to 25’ away. The drain hose (leading to bathtub, sink or toilet) can be turned off for a long soak or left on for constant draining, allowing a shower. The drain hose and vacuum, both included, empty the tub thoroughly. Compared to the comfort and convenience of the EZ-Bathe, nothing else holds water! This scale is a rechargeable unit that can accurately weigh a client up to 1000lbs. This units accuracy range on weight measurements is with in 1lbs @ 1000lbs. The scale is a necessity for clients that are wheel chair bound and have no other way to accurately measure their weight, the unit is mainly used for clients diagnosed with; Hydro-lymphoma, Diabetes, COPD, Congestive Heart Failure, ect. These clients are in a situation where the accuracy and dependency of weight recordings could determine a life or death situation. No other scale on the market can weigh in like this unit! 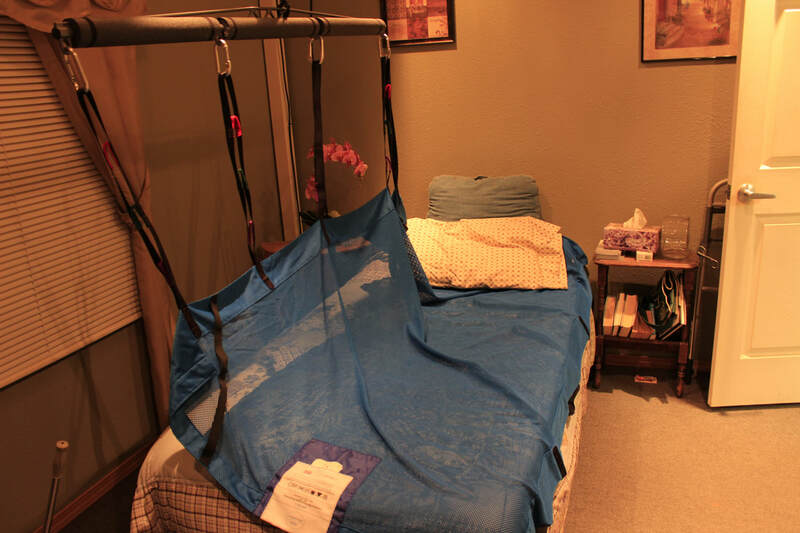 The re-positioning sheet and bar allow a single caregiver to roll a completely immobile person on to their side in a safe and secure manner. When using the re-positioning sheet and bar it allows a client with existing fragile skin to get air to areas of the body where skin breakdown is most common. This accessory also aids in digestion, preventing skin break down, and gives the potential to heal existing broken skin by relieving pressure points. This accessory is only able to be used with an EWC Lift and is not adaptable to any other lift.